Recently an MSNBC reporter got a dose of reality while doing a report on President Trump’s promised border wall. The reporter was covering the new prototypes of Trump’s border wall near San Diego when the interview was interrupted by a small group of “migrants” jumping over an existing part of the wall. As the rolling camera captured the scene, three people, including a girl with a pink backpack, could be seen turning themselves in to the Border Patrol officers on horseback. It was all captured in the background of MSNBC’s shot. “We’re going to continue to witness this. It plays out on a regular basis for us,” Soboroff said. “And it did just here, just now,” the reporter said. According to MSNBC, the three people were asylum seekers and were not from Mexico. David Bossie, a former deputy campaign manager for the Trump campaign told Fox & Friends that MSNBC witnessed the facts in action. “MSNBC went down there to do one story and it came away with another,” Bossie told the network on Tuesday, Oct. 24. “The facts got in the way of their very good, dishonest story. “The president’s right, we need a wall and that’s an exact reason why, a perfect example,” he added. See more of Fox’s interview below. On Oct. 17, Trump tweeted a video of the new border wall prototypes being erected. “BORDER WALL prototypes underway!” he wrote in the video post that garnered over 103,935 likes and over 30,961 retweets as of writing. 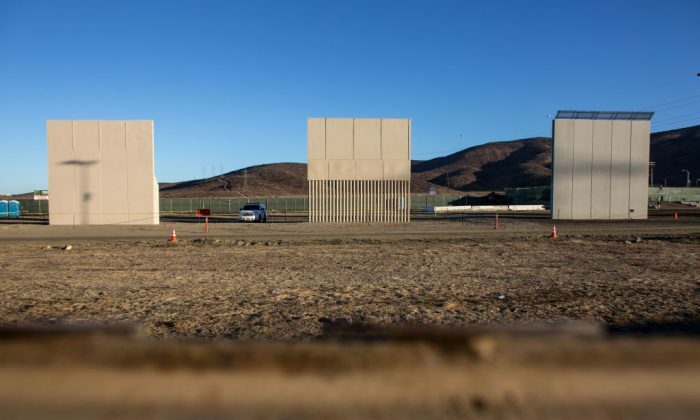 Earlier this month, the House Homeland Security Committee passed a bill that included $10 billion in spending for a border wall, including “wall, fencing, technology, air assets, and other barriers” on Oct. 5. In addition to the wall funding, the bill would add 5,000 Border Patrol agents and 5,000 Customs and Border Protection officers. The bill, named “Border Security for America Act,” includes $5 billion to help combat illicit drug trafficking at major ports of entry—most drugs enter the country over bridges and through airports, rather than over the border. The bill would also make up to $35 million in funding available to deploy the National Guard to help with aviation and intelligence support along the southwestern border, especially in Texas, which has called for help in securing the border. Texas has one of the more difficult borders to secure, due to much of the border being the Rio Grande river. Most of the nation’s illegal border crossers come over the river in the Rio Grande Valley. The bill, introduced by Rep. Michael McCaul (R-Texas), also targets visa overstayers by fully rolling out biometric entry and exit systems at all ports of entry. A significant portion of the illegal immigrants in the United States are visa overstayers. In 2016, more than 544,000 people on visas who were supposed to leave the United States did not, according to the Department of Homeland Security.